Under the guise of going grocery shopping and buying seed packets for our gardens, Karleen and I went to the supermarket. It was a neighborly thing to do. But tucked in our cart was a book recently purchased. 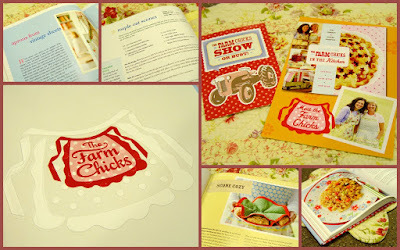 It was the "Farm Chicks in the Kitchen" cookbook! Along with all the regular supermarket advertising in the newspaper and fliers was word that the "Farm Chicks" were coming to town and would be having a book signing event. As a reader who enjoys "Country Living" magazine (a place they have been featured many times) and as a friend of Paula from Elm Street (she loves the "Farm Chicks"), it seemed that meeting the "Farm Chicks" would be something that would spice up the day, the week, the month, the year! And it did! Karleen and I were there early and the lines were short. Teri and Serena were friendly, cheerful, and informative. It was fun to chat and learn from them. They are true country gals --- with a genuine down-home friendliness. Their books were displayed nearby, ready for eager buyers. The pages within are filled with great country recipes and wonderful kitchen and craft ideas. The book begins with the life story of both Teri and Serena; human-interest blurbs about their growing up years which set the stage for their "Farm Chickness" in later years. I especially enjoy the story of how they met. One time Teri was preparing dinner when Sister Kathleen called about a new woman to their church. She needed a sponsor. Would Teri be willing to mentor her? She was, and the rest is history. A beautiful friendship developed between Teri and Serena --- and a multitude of creative ventures and ideas resulted from that simple phone call. Soon they were not only cooking and preserving together, but going off on junking adventures in search of antiques and memorabilia to satisfy their home decorating urge. Eventually they had 'too much stuff' and had their first yard sale in a neighbor's yard. From there the fun continued and continues still with "The Farm Chicks Antique Show" that is held each year. My cookbook is now duly autographed by both Serena and Teri. I'm enjoying reading the recipes and preparing to try some of them in my own kitchen. Intermingled with recipes and kitchen tips are great stories of their lives and the lives of those they meet as they venture to new places in search for antiques and more. Sprinkled throughout the pages I've also found terrific ideas that will satisfy any one's creative urge! Instructions for vintage aprons made from old sheets, and a scone cozy that is perfect for afternoon tea, ideas for shelf trims, and directions to make food covers --- and much, much more --- are treasures tucked here and there between sections of recipes and lore. Their book is on my 'most highly recommended' list --- and they are on my 'even higher recommended' list as ladies of farm charm, well deserving of the name "Farm Chicks". You may visit Teri's and Serena's website and blog easily by clicking on my "Friends of Gracious Hospitality" blog roll. They have been on my blog roll for awhile --- thanks to Paula from Elm Street and her enthusiastic recommendation of their creative expertise. To Teri and Serena, it was great to meet you! Happy trails to you as you continue teaching others to live well, laugh often, and cook much! I hear so many good things about these gals! I'm glad that you had the opportunity to meet them and that you are enjoying their book. Hmmm, wonder if they'll head East? How exciting! I love meeting and having books autographed. I would love to attend their Farm Chick Antique sale sometime. What fun! I am so glad you were able to meet them and have a nice chat. Very good LaDonna! Now I feel bad I didn't buy a book and get it autographed! I was thinking of buying that book with my Amazon credit. I'll have enough at the end of this month. Knowing you recommend it, I'll definitely be choosing that book. It sounds just like the lovely "get away from it all" cookbook I love. How fun and cool! Love the photos. Oh what fun! they have such pleasant faces!! The Farm Chicks were as sweet as they look! I describe them simply as COUNTRY CHARM! How wonderful to meet the Farm Chicks! They seem to be so genuine! Thanks for sharing! Isn't it fun to meet "celebrities" and get their autographs! Looks like you had more fun at the grocery store than I did! Oh I will certainly pop by their blog and have a look see. .I love cookbooks. . all kinds. . thank you for sharing your book signing adventure with us. What fun! I love books like that, I'll be going over there next to check them out! Oh I am so jealous. I just bought their book and love those ladies. I am glad you got to meet them. Oh how fun. I'll have to check it out! I just love reading fun stuff like this!! I'm so glad you got to meet them, and had them sign your book. Couldn't have happened to a sweeter lady!! It's also great to hear that they are really special ladies!! Genuine articles are becoming more and more difficult to find!! WoW! Another book to be on the look out for !